Available on the iPhone and iPad, Word Swag is a tool which when installed to your iPhone or iPad will open up a realm of possibilities enabling you to add words, quotes, or any other text you desire, in a variety of layouts. Incorporating the unique Typomatic™ engine, Word Swag significantly reduces the time it takes for you to accomplish these design effects to a few taps, where it might take a few minutes, and in some cases, hours to process. To let potential users see how it works, the developers, Oringe Photo & Font Caption Co. has created a website and video demonstrating the process beautifully. Simply go to wordswag.co to check it out. Word Swag - Cool typography & quotes generator for your pic employs a very easy-to-use technology and has a smooth-running user interface. First, you select the picture you wish to enhance and then add your desired text to it. 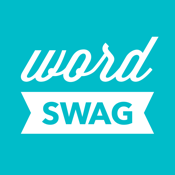 Word Swag lets you choose from a database of dozens of pre-made backgrounds and hundreds of captions and quotes. The developers constantly work with their world-class graphic designers to create stylistic fonts for your to use on your texts and are constantly adding new designs. Applying one of these 27 graphic font styles on Word Swag - Cool typography & quotes generator for your pic will produce your very own bright and shiny design. If you find the design is not to your liking, simply select one of the five other options presented to you, or use the icon with a dice symbol to view an infinite number of randomized choices. One you have finished creating your meaningful, beautiful image, you can quickly share it on Instagram, Twitter, or Facebook through this app. You can also see how other users have used this app creatively using the hashtag #WordSwagApp, or by viewing the “best of” photos on the WordSwag Instagram account to draw inspiration for your own creative ventures. Sure, there are similar apps on the market which are available for free, but you do get what you pay for with Word Swag - Cool typography & quotes generator for your pic; the developers make sure that they are accessible for feedback so they may continue to provide great tools, features, and a unique user experience. Whether it's a birthday card for your grandma or a poem for your lover, Word Swag - Cool typography & quotes generator for your pic will help you unlock a world of designs and tap into new realms of creativity. I feel it's worth the $1.99 to simply be able to experience the integrated Typomatic technology on the iPhone or iPad.